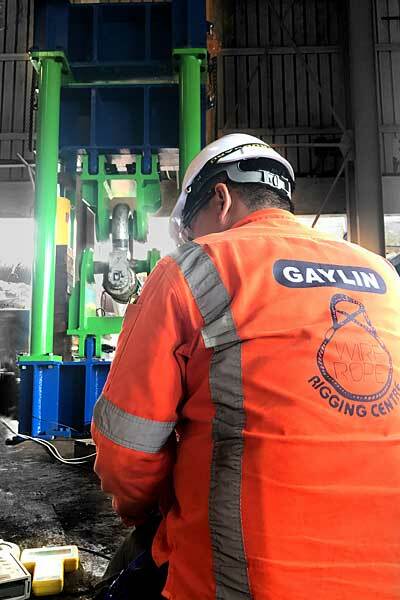 Gaylin, a specialist supplier of lifting, rigging and marine equipment, has recently built and installed a custom 600-tonne calibration machine at its Singapore headquarters that calibrates tension and compression load cells to its full capacity. Integral to the Gaylin Group of companies’ (of which Rigmarine is part) below-the-hook offering to offshore oil and gas, renewables, construction, break bulk, shipping and maritime industries, is a full range of force measurement, load monitoring and suspended weighing load cell equipment sourced from UK manufacturer Straightpoint. In addition to Singapore, Gaylin has facilities in Korea, Malaysia, Vietnam, China and Indonesia. Rigmarine hubs, meanwhile, can be found at its most recently opened site in Aberdeen, in addition to Azerbaijan, Kazakhstan and the Middle East. Most of these sites have calibration machines ranging between 50 t and 300 t, depending on the location. In simple terms, calibration matches the readings of a load monitoring device, or other machine, with those of a standard to determine accuracy. There are a variety of purposes and requirements for calibration of load cells beyond standard process upon completion of manufacture. Companies may choose to calibrate as they receive stock, while some countries or regions insist that calibration takes place as they arrive in certain geographies or onsite. Load cells are also calibrated as they return from projects or during service procedures. A number of recent projects prove the point. Notably, Rigmarine recently delivered eight 52-mm Running Line Dynamometers from Straightpoint, which measure tension on mooring lines, for a long-term rental on an offshore construction vessel. Given the short lead-time, it had to rely on 24-hour operation at Straightpoint in the UK, combined with airfreighting of equipment and onsite calibration to fulfil the commitment. Meanwhile, after an 18-month project in the Caspian, Rigmarine’s 1,800-t, six-point centre of gravity weighing system (also from Straightpoint) has returned to the Middle East, where it will be held until its next assignment.